Daniel Boulud was named a Best New Chef 1988 at Manhattan’s Le Cirque. He now has more than a dozen restaurants around the world, including his flagship, Daniel, in Manhattan. As a young chef in France, Daniel Boulud worked for luminaries like Georges Blanc and Roger Vergé, who demanded superb ingredients. But it wasn’t until he arrived in the US that Boulud discovered truly amazing scallops. “I was blown away by the delicate, sweet flavor of the ones from Maine,” says the chef, who is celebrating the 20th anniversary of his New York City flagship, Daniel, this year. He features them in excellent dishes like “black tie” scallops, layered with truffles and baked in puff pastry. Even more popular is this recipe. 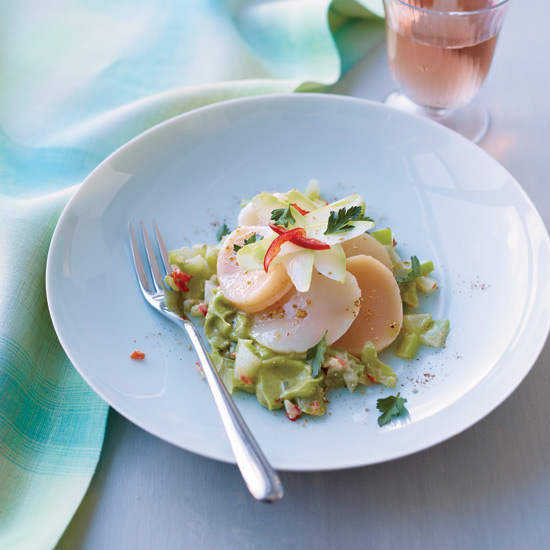 Boulud quickly cooks scallop slices, then serves them with a rich, tangy avocado-tomatillo sauce and Indian-spiced hearts of palm (we substitute chayote, which is easier to find, and cherry peppers for the Fresnos that Boulud pickles).